Discussion in 'Engine/Tuning' started by [email protected], Feb 17, 2009. 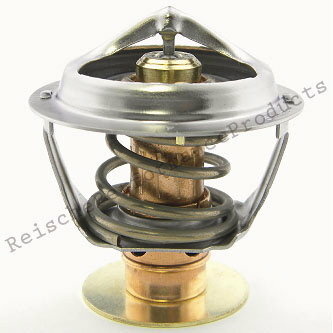 I just wanted to take a moment to introduce my company and it's first product, the 170° Performance Thermostat. This t-stat was developed with the help of a few other members on SVTP last year, it is basically an OEM-style thermostat fitted with a lighter spring to lower it's opening temperature. UPDATE: As of Spring 2011 the Terminator (FORD-4D) thermostats will now be produced with a standard 170° heat motor and spring combo. I invite those of you who have already purchased one of these units to please share your experiences and to post any questions or comments regarding it in this thread. I would also like to use this thread to discuss and address known cooling system issues as well as develop further improvements. i am looking forward to installing mine, joel. i will post up here when i install it! Cant wait to get one of those stats in my car,GL with the sales Joel! Put mine in last week in place of a stock drilled. In 82* ambient humid Florida air at cruise I was seeing 181* max. Hung around 178* most of the time. The drilled stocker would easily see 190*+ in the same conditions. In driving the car the last few times I consistantly see lower overall temps. I doubt I'll ever see them over 200* again. My low fan is set to 186* and hi to 190*. I have an Evenflow cooling mod and run 70% water 30% coolant, other than that it's stock. In the old 5.0 centrifugal days everyone ran a 180 deg. (Question: is that too cold for Terminators? Not available anymore??) Some ran 160 deg. but was generally thought to be too cold? Actually 180* is probably an ideal ECT for most engines, problem is our 4V engines use a different cold-side thermostat setup. Because a relatively low number of vehicles share this application with us there isn't much available from the aftermarket that actually fits the bypass. Ford calls the stock Terminator stat (RT1168) a 180* but it opens very slowly and must reach temps well above 190* before it flows much coolant. I called my stat a 170* because this is the ECT at which the stat starts to open, however it also opens faster than the OEM. In the mild weather the cooler air will bring ECTs down pretty quick once you get moving but in the summer the fan settings will pretty much dictate your coolant temps when not on the fwy. No fuel problems but pretty much the same issue as with running any low temp stat, cold weather performance can result in less than ideal oil temps. If your vehicle is driven regularly in very cold conditions it may be best to swap in the OEM t-stat during the winter. My stats have never been tested in sub-freezing conditions. Thanks Joel for putting the time and effort into making something specific for us. I would like to add links to the threads where all of this was talked about. I think it will help others to understand what they are actually purchasing and how it differs from what other companies sell you off the shelf. I have some cooling issues with my Cobra. Had Stag 4 port job, larger craink shaft pulley and small SC pulley. I installed a duel pass heat exchanger and the SC is still getting so hot that if I stop at a light for too long or stop and go traffic, my car starts to miss. I have to get moving up to 50+ for about 5 mins. + to get it to stop missing. Any pointers? Is your intercooler pump running? In the smaller IC reservoir on the left you should see fluid pumping and bubbling, if not your pump may be burned out or has an air pocket keeping it from starting. Not to change subject - but no aftermarket intercooler pumps? None that are plug and play I know of. I really want to "finally" order my 180* thermostat from you. My car is a garage queen & I only take it out for long/fun trips or when the weather is great outside. The only time I never drive the car is when it's raining outside. I still can't decide which one to get. I realize that even with your (best & only in the business thermostat) our 03/04 COBRA's still run hot due to the improper coolant path on the drivers side head. Should I get the $55 unit? :shrug: I would love to talk to you for a few minutes sometime bud. even with your (best & only in the business thermostat) our 03/04 COBRA's still run hot due to the improper coolant path on the drivers side head. Are you talking about the temps just in the driver's side head?